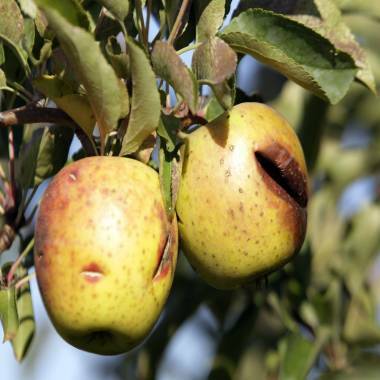 Frost- and drought-damaged apples hang on a tree Monday at Tuttle Orchards in Greenfield, Ind. Although this year's apple supply has been hard-hit, shoppers are unlikely to see a shortage at the store. First bacon, now apples. The crispy, sweet, tart treat is the latest food that headlines suggest is in danger of going missing from your supermarket due to crimped supplies. The culprit is an early warm spring that brought out the blossoms on the apple trees, followed by a March-April cold snap that killed them off. No blossom, no apple. The crop in Michigan, the nation's third largest source of apples, is down 80 percent. New York's, the second largest source, is cut by half. The U.S. Apple Association estimates this year's inventory at 202 million bushels, down about 10 percent from a 5-year average of 225 million. A bushel equals 42 pounds. That's 966 million fewer pounds of apples to go around for biting, bobbing, and baking. The USDA's estimates are for even less, down 14 percent and the lowest harvest in 20 years. Buffering the shortfall somewhat is Washington state, boasting a near-record crop of 145 million bushels, up from their usual output of about 125-130 million. The state normally supplies 60 percent of the nation's apple inventory. The question is whether they can get enough hands to pick them before the apples begin falling. If they're not in the back of the truck by Thanksgiving, they're on the ground and all that surplus goes to the worms. But even if Washington plugs their picker gap, a recent USDA report says it won't be enough. The harder-hit central and eastern states are responsible for supplying most of the processors, who in turn use fresh sliced apple slices and frozen apples for pies, baking, canning and juice. Production in those categories is projected to fall 30 percent, which could boost prices in these categories, although there are "strategic apple supplies" distributors can dip into. There apples are put "to sleep" naturally and placed into storage year-round. Local apples may be hard, or impossible, to find in the more heavily dinged geographies, but overall you should see full bins of apples at the supermarket throughout the year. The most commonly produced apple in America, the Red Delicious, is actually seeing slightly lower prices this year from last, down .025 dollars from a year ago. Otherwise prices for early varietals are running about a dime more per pound than a year ago. "Right now, we are expecting no shortage and should be able to keep the apple supply steady," the U.S. Apple Association's Mark Gedris told NBC News. "We don't expect people to be paying more for apple pies this Thanksgiving." It's not until the spring that shoppers might notice changes at the supermarket level, although by then imports from Chile and New Zealand can start to pick up some of the slack. That said, your homemade apple pie isn't totally safe this Thanksgiving. Two of the most popular varietals for baking are also the two hardest hit. Macintosh and Empires apples, which come from Michigan and New York, respectively. Instead you can try using Honeycrisp or Macouns, or the Golden Delicious. Listing of the Week: Which of these 2 islands will you buy?